Born in Cleveland, Ohio - The Pickett Brothers were raised in an era where the cocktail party was something you had not only at family gatherings and holidays, but also poolside in the summer with neighbors and friends well into the night by the fire pit. The adults would make their specialties like the Highball, the Moscow Mule, or a Boilermaker. The kids on the other hand were treated to vibrantly flavored cane sugar sodas and unique ginger ales. Many times mixing the flavors of the different sodas to make their own special cocktail. So it's no wonder that the three brothers show a love of good drink and culinary adventure, spending a combined 50+ years in the food and beverage industry, traveling the world, and seeking out the best in food and drink. 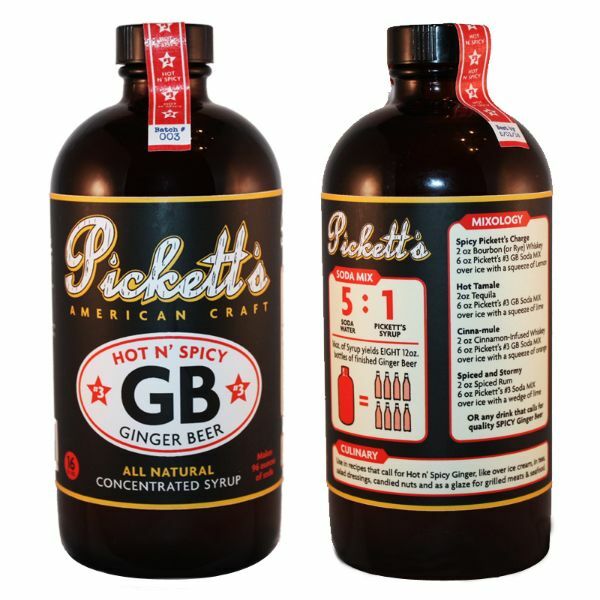 Now we present Pickett Brothers Beverage, an all-natural soda and syrup company based in Brooklyn, NY. We are focused on reinterpreting the flavors of your youth and reinventing your favorite cocktails with our attention to detail, knowledge of the industry, and dedication to quality in everything we do. One of the spiciest Ginger products available. Dry, crisp and clean with mouth-filling spice that grows and lingers. For those who like more extreme heat & spice. Mixes well with bolder & barrel-aged spirits (Whiskeys/Cognac/Rum/Mezcal) and also balances spirits infused with fruits, honey or maple.